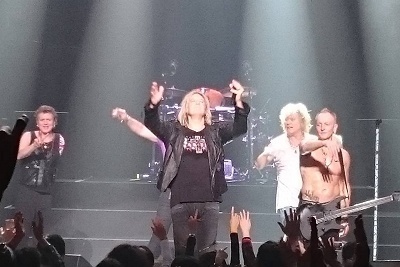 Def Leppard played show 88 of the 2015 World Tour earlier today in Sendai, Japan with 19 songs performed. The show took place at the Sendai Sun Plaza Hall. The band's first time in Sendai since 17th November 2002 during the X/Ten tour. The 4th appearance by the band in this city. The first visit was in June 1993 during the Adrenalize tour at the same venue. The final show of the four date Japanese tour. The first shows played after the release of the new studio album on 30th October. Currently Number 1 on the International Artist album chart in the country and Number 8 on the main Oricon album chart. This was the 51st show played by the band in Japan. Including the Tokyo Acoustic Night show which took place 20 years ago (11th November 1995). So technically speaking the 50th all electric full concert here since the first show in January 1984. The Sun Plaza Hall has been played three times now. The second time was in 1996 on the Slang tour. A show which featured Vivian playing a short acoustic song jokingly titled 'Going Back To Sendai'. 'Let's Go' opened the show again with 'Dangerous' played for the second time on the tour. Due to the lack of shows in Sendai the band had never played 'Let It Go', 'Rock On' or 'Undefeated' here before today. The stage was just as small as the two previous shows and the band used the exact same setup. Vivian and Phil both using Marshall guitar amps in front of the two unused side video screens. They usually use Engl (Viv) and EVH Gear (Phil). The next show takes place on 17th November in Sydney, Australia. Played for the first time in Sendai. Played for the first time in Sendai and its second time on this tour. Played for the second time on this tour.